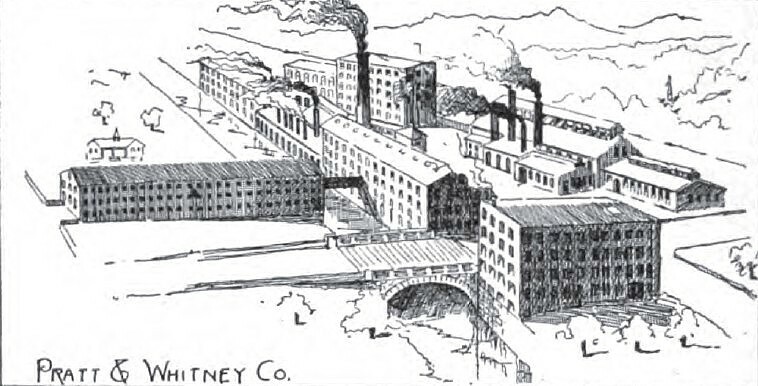 Manufacturers Index - Pratt & Whitney Co.
Pratt & Whitney began in a small way in about 1860. 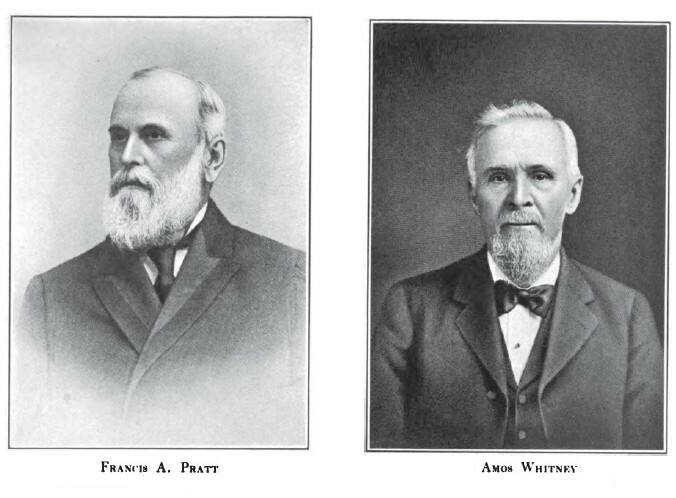 The founders, Francis A. Pratt and Amos Whitney, were working at George S. Lincoln & Co.'s Phoenix Iron Works when they decided to establish their own firm but they both kept their jobs at Lincoln & Co. In 1862 Pratt & Whitney's shop was lost to fire. Messrs. Pratt and Whitney took on a partner, Monroe Stannard, who helped them establish a new shop; with Stannard joining the firm the name changed slightly to Pratt, Whitney & Co.. The Civil War led to a large increase in business, mainly for machines for manufacturing Colt firearms. In 1864, Messrs. Pratt and Whitney began working full-time for their own firm. In 1869 the Pratt & Whitney Co. was incorporated. In 1879 the company hired George M. Bond and Harvard University professor William A. Rogers to establish a "standard inch". As part of their work, the two men developed a precision measurement machine that became known as the Rogers-Bond Comparator. This work not only improved Pratt & Whitney's accuracy and advanced the ability to manufacture interchangeable parts, it led to a growing business in making precision measuring equipment. Over the next decades the company grew their business of milling machines, screw machines, planers, drill presses and lathes, along with their newer specialty in precision measuring machines. Certain of Pratt & Whitney's small drill presses were actually made by Sigourney Tool Co. In 1901, Niles-Bement-Pond Co. acquired Pratt & Whitney Co. The Pratt & Whitney division of Niles-Bement-Pond continued to operate fairly autonomously. In 1906 Niles-Bement-Pond established a Canadian subsidiary, Pratt & Whitney Co. of Canada, Ltd. The location—in Dundas, Ontario—and the list of company officers are an artifact of Niles-Bement-Pond's relationship with John Bertram & Sons Co., Ltd., a Dundas-based maker of large machine tools. In 1925 the Pratt & Whitney Aircraft Co. was established to manufacture airplane engines. Canadian Pratt & Whitney Aircraft Co., Ltd. was established in 1928. In 1929 these firms left the Niles-Bement-Pond umbrella but were allowed to retain the Pratt & Whitney name. These firms are outside the scope of this website so we will not say more about them. In the meantime, the original Pratt & Whitney Co. gradually dropped their machine tool lines to further specialize in measurement machines. In 2003 the name was officially changed to Pratt & Whitney Measurement Systems. The Pratt & Whitney Company was organized in July, 1860, with a capital stock of $350,000, since increased to $500,000. The premises of the Conpany are on the north bank of Park River, a branch of the Connecticut, about one-third of a mile front the Union Passenger Depot—the tracks of the New York, New Haven and Hartford, and the New York and New England railroads passing close to the buildings, to which branch tracks are led, for convenience of transporting iron, steel, coal, etc., for the supply of the works, and for removing finished machinery. The largest or main building is of brick, with brown-stone trimmings, and is four stories high, 225 feet long and 45 feet wide, the floors having an area of 40,500 square feet. A brick building, 146x42 feet, three stories, erected in 1881, for heavy machine work mainly, has about 18,000 square feet of floor area. A four-story and basement brick structure, finished in 1888, has about 44,000 square feet of floor space, for the storage of patterns and tools, and is fitted up with an elevator, overhead tramways, and trolleys for the convenient, handling of machinery. A two-story and basement brick building, finished in 1891, has about 39,000 square feet of floor surface, for manufacturing and storage. This building is heated by the blower system. Each building is furnished with a system of automatic sprinklers, for extinguishing fires, and the Company has powerful pumps for supplying the apparatus, and for other purposes, should the ordinary city supply of water fail temporarily from any cause. The forging-shop is 175x42 feet, having ten fires, a Marchand & Morgan steam-hammer of 700 pounds, a Hotchkiss atmospheric hammer of 60 pounds, three drop-hammers, two adjustable stroke tilt-hammers, two trimming presses, and a patent power shear. The main foundry building, 120x60 feet, with an extension 60x 50 feet, has wings containing a cleaning and pickling room, 48x40 feet, a room for core-making, with ovens of large capacity. The foundry also has a crane of fifteen tons lifting power, a smaller one for lighter work, a small cupola for special iron, two McKenzie cupolas, known as Nos. 2 and 4 of this celebrated make, and a large McKenzie blower. In the machine shops are four hundred lathes of various kinds, one hundred and fifteen planers, eighty-five drilling machines, one hundred and twenty milling machines, eighteen screw machines, thirteen gear and rack cutters, ten boring mills, and two hundred other machines, in addition to the tools used in the pattern shop. When all these are running, the concern can give employment to about nine hundred and fifty men. The four engines that drive this machinery are of 200 horse power. All the rooms are heated by steam, and lighted by gas or electricity. The company's web site has a history of Pratt & Whitney Note especially the links at the bottom to a 118-page history of the company covering the years 1860 to 1930. Listed in the 1874 work, Wiley's American Iron Trade Manual of the Leading Iron Industries of the United States : "The Pratt & Whitney Co. - Location of works, Hartford. Lathes, presses, machinists' tools, organ blowing machinery." There is perhaps no better example of a steady growth from very small beginnings to an extensive plant than in the case of the Pratt & Whitney Co., of Hartford, Conn. Both Mr. Pratt and Mr. Whitney are thorough mechanics, Mr. Whitney having learned his trade from Mr. Blood, in Lawrence, Mass., in the old "Essex Machine Shop," which was afterward moved to Manchester, N. H., and is now known as the Manchester Locomotive Works. Mr. Pratt was apprenticed to Aldrich & Hayes, of Lowell, Mass., and the year 1854 found them both working at the Phoenix Iron Works of the George S. Lincoln & Co., of Hartford, Mr. Pratt being the superintendent and Mr. Whitney a contractor in the shop, showing that the contract system, which is so prevalent in Hartford, was in use many years ago. In about 1860 Mr. Pratt and Mr. Whitney started a small shop on Potter street, in what was known as the old car shop, and made almost anything in the machine line which was wanted, one of their first products being a lot of "knock-off" motions for textile machinery. The force then consisted of four men, not including either Mr. Pratt or Mr. Whitney as they both retained their positions with Lincoln until 1864, but was looked after by Mr. Joseph E. Marvel, who is still with the firm. In 1861 they were burnt out and one of their men lost his life. 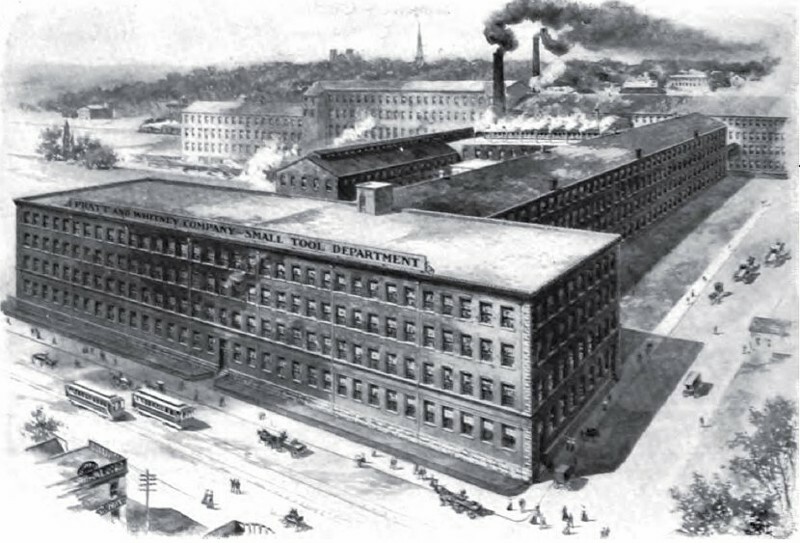 Their next shop was in the old Wood Building, near the Post office, and was practically started by Mr. Monroe Stannard, who came to Hartford from New Britain, and was admitted to the firm in 1862, the firm then becoming Pratt, Whitney & Co., and in 1869 the Pratt & Whitney Co. was incorporated. The war breaking out soon after, created an immense demand for the Colt arms, and the new firm made many machines for them; milling machines, rifling machines, edgers (or vertical spindle millers for profiling or edging the forgings) and similar work. Moving to their present location in 1862, they built quite a large shop for that time, and rented the greater portion of it to the Weed Sewing Machine Co. and to Robbins & Lawrence, who were making the "Sharps" rifle. Here they have remained and continue to add buildings to the plant until one wonders when they are going to stop, and yet the business keeps increasing so that everything is crowded most of the time. Their milling machines, screw machines, planers and drilling machines furnish a large portion of their work, and they have probably made 7,000 Lincoln millers since they started. Of the screw machines in use today, probably the majority of them were built in these shops, and the special machines are too numerous to mention, but they form quite a large proportion of their work. March 1906 Canadian Machinery . The Pratt & Whitney Company of Canada have been incorporated with a share capital of $100,000, for the purpose of manufacturing and dealing in machinery and tools. The head office will be in Dundas and the provisional directors, R. C. McKinney, L. B. Morgan, C. L. Cornell, Henry Bertram and Alex. Bertram. The History of North American Small Gas Turbine Aircraft Engines, by Richard A. Leyes and William A. Fleming, 1999, provided information about the establishment of the aircraft engine companies. Patents assigned to this firm and issued between 1861 and 1870 give the company name as Pratt, Whitney & Co. Patents issued from October 1870 onwards give the company name as Pratt & Whitney Co. Thanks to email correspondent Richard Kline for providing us a list of several Pratt & Whitney patent numbers. The American Precision Museum website has a biography of Francis A. Pratt. The Wikipedia page on Pratt & Whitney Measurement Systems provided some data. More information on the aircraft-engine Pratt & Whitney companies is available on Wikipedia's Pratt & Whitney aerospace page. The University of Connecticut's web page on the Henry Stieg Collection of the Pratt & Whitney Co. papers provides a brief overview the of company. Pratt & Whitney's History is available on the company's website.